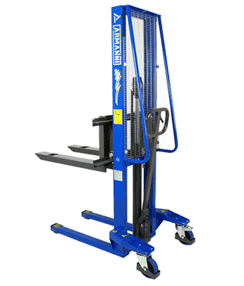 The current regulations in terms of health & safety at the workplace impose very strict limits on the manual movement of loads by the operator; therefore, the ALFA M manual stacker represents the simplest and most economical solution in order to move medium-light loads in compliance with the current regulations. This manual stacker is operated with a hand pump, which gives the operator greater control over the load which the stacker is moving. A quick descent control is located in the handle of the hand pump (similar to a pallet truck), the ALFA M is easy to control and maneuver, with and without a load. The ALFA M has manually adjustable forks on a fork holder plate, which can be adjusted by the operator with ease. This makes the ALFA M manual stacker perfect for a wide variety of applications. It comes as standard with built in safety equipment including; crush resistance fairing on the wheels, parking brake and mast mesh guards.